Bald-faced hornets: intimidating but not all bad! When most of us hear the word ‘hornet’, it’s not a very positive thing. If one happens to fly by within a few feet, they don’t get a very warm reaction. At least they are unaware of this. They’re just out foraging for food for their young and that’s what their focus is. At least until they sense a threat to their nest. Bald-faced hornets are very protective of their nests and a perceived threat is the most likely instance when they will sting. And when they do sting, it may be very painful (the venom is more potent than that of bees) and they will sting repeatedly. So what’s so good about them? Like other wasps and bees, they play a role in pollinating flowers, especially late in the season. Early to mid summer is spent collecting insects to feed to their larvae, thus helping to control insect pest populations, including that of the nearly equally underappreciated yellowjacket. 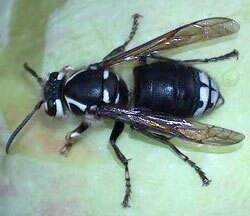 The bald-faced hornet (Dolichovespula maculata) is not a true hornet, it is a yellowjacket wasp. Members of the genus Dolichovespula all build large, papery nests in trees, shrubs or on structures. 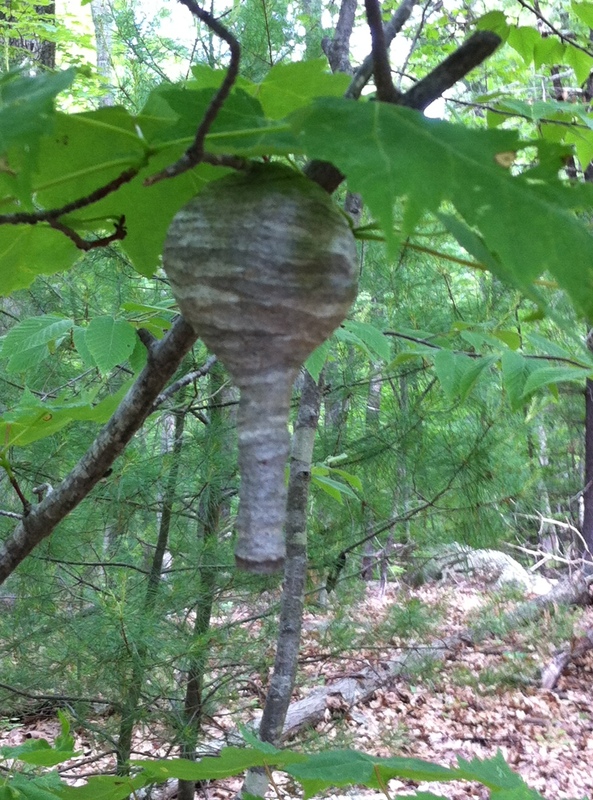 The paper wasps build exposed nests in which the individual cells are visible. The bald-faced hornet is native to North America and is found throughout most of the 48 contiguous states, Alaska and Canada. To find out a little more about this sometimes intimidating insect, let’s take a look at its life cycle. The overwintering stage is the fertilized queen. In the spring, each fertilized queen selects a site for a nest and begins construction. These hard workers collect tiny bits of weathered or rotting wood from trees and fences and mix it with saliva by chewing it. This results in a sticky, papery material that is used in nest building. The grayish-brown nest is small at first and is attached to a tree, shrub or building, usually at least three feet off the ground. The surface may have streaks of gray and tan that give it a swirled appearance. The queen constructs several cells within the nest and deposits one egg into each. The young are fed and tended by the queen and grow up to be sterile female workers. They take over the feeding and nest tending duties while the queen spends the rest of the summer laying eggs. Eventually the nest will contain several layers of cells resembling a honeybee comb, may be as large as a basketball (or more! ), and will be home to hundreds of hornets. In late summer to early fall, fertile females and males are produced and mating occurs. Fertilized females from this generation will overwinter and all other members of the colony will die of old age or freezing. The fertilized females overwinter in sheltered places such as tree stumps and become next year’s queens. As mentioned above, the bald-faced hornet is beneficial both for pest control and pollination. During early to mid summer when there are many larvae to feed, insect prey are caught, chewed up, and fed to the larvae. Insects preyed upon include yellowjackets (a favorite), flies, caterpillars and many other insects. Once the number of larvae in the nest declines, the hornets’ diet consists mainly of nectar and pollen from flowering plants. They will also forage around sweet foods at picnics, etc, and can be a nuisance at times. Upside-down flask-shaped nest in early summer. Photo by J. Allen. The nest itself is an impressive structure for its materials and method of construction, its durability, and its functionality. Some nests are constructed around a small twig or branch which gives them added resilience in the wind. The entrance is located on the bottom of the nest and there are vents built into the top to allow hot air to escape. Early in the season, the nest sometimes has the shape of an upside down flask with a long entrance tube. The one shown in the photo was seen in the woods in Granby, CT. Nests are only used for one season then abandoned. However, sometimes other insects and spiders will move in for the winter. Birds know this and might tear apart abandoned hornets nests looking for food. Because these hornets rarely sting, except in defense of the nest, it’s best to leave them undisturbed unless they are within several feet of human activity. In these locations, you may decide to remove the nest, preferably before the population builds up too much. If you’re allergic to bee and wasp stings, or just nervous about attempting removal, have this done by a professional pest removal service. If you decide to do it yourself, there are precautions that should be taken. Use a wasp and hornet spray and apply the product at night when hornets are least active and most will be in the nest. DON’T stand away from the nest and spray the outside. This will get the hornets all riled up, won’t kill them, and they will be in a stinging mood for several days. The spray must be applied directly into the entrance of the nest while holding the nozzle against the hole (if possible) to prevent the hornets from escaping. Some products can spray a stream up to 20’ if needed. Wear long sleeves and long pants, protective gloves and goggles, and a head covering. You may have to do more than one application a day or two apart to get those individuals that weren’t at home the first time. Pesticides are poisons. When using them, always read and follow instructions carefully. Avoiding disturbing a nest. When working in shrubs or trees, check carefully before you begin to see if a nest is present. Avoid using perfumes or wearing brightly colored clothing for outdoor activities. At picnics, keep food covered as much as possible, especially late in the season. Be cautious about drinking sweet beverages like soda or lemonade from cans to avoid swallowing a wasp/hornet and getting stung in your mouth or throat. The bald faced hornet has a smooth stinger and it will not stay in your skin unless you swat the hornet and cause it to break off. If this happens, remove the stinger with tweezers. Cover the sting site with an ice pack for five minutes at a time. Over-the-counter pain and itch remedies can be helpful. Avoid scratching. Native Americans apply mud to stings for 15 minutes or so to help draw out the venom. Two yrs ago I noticed a few black flying insects with a couple of white stripes on its tail flying around my new Magnolia tree. I have been nursing this tree since it was planted 5 years ago and not growing well.Three years ago I noticed what I thought to be a fungi on the branches but not the leaf, so I treated it with an anti-fungi. Last summer I found the same stuff again and decided to scrape it off. In doing so, I noticed this red slime under what reminded me of a scab. I went on internet to look up tree fungi and incorrectly diagnosed the tree having scales/skabs. Again, I noticed 5 to 8 black flying insects around the tree, so I sprayed Raid. This summer my magnolia tree was loaded with these scabs and more of these black flying insects. I searched through thousands of pictures of insects and could not identify this thing. I had been focusing on wasps, bees, flying ants… Finally tonight I found this site and your pictures of the Baldfaced hornet! WOW lucky me! All the spraying I have been doing and they never attacked!? They are NOT dying and I never seen a nest; the tree is only 5 feet high & about 4 feet wide. COULD THE NEST BE UNDER THE PLANK ROCKS? Or underground? The hornets are not your problem, the magnolia scale is an insect feeding on the magnolia. The scale excrete a sugar rich substance called honeydew. The hornets are feeding this excrement. Do not spray anything for the hornets. Eliminate the scale and honeydew will stop, therefore the hornets will stop visiting the magnolia. See the fact sheet links below on control of magnolia scale. Hi, I have a nest right outside my back door and we have been living in harmony with them but all of a sudden they are getting aggressive and defending the nest. We’d like to remove them but do not want to kill them. Any suggestions? Christa, You can wait until the end of the season and remove it when they are no longer inhabiting it or you could call in a licensed professional to remove it (if they would do that without killing the inhabitants). How is it possible for someone to remove the nest without killing the inhabitants? They would have to relocate it, right? I’m wondering how you would re-hang it. 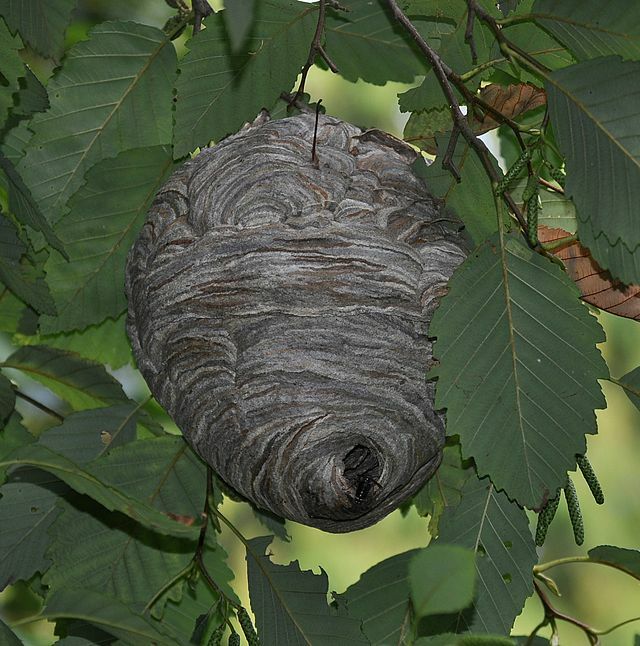 I have never heard of relocating the entire nest of hornets, and it would be a dangerous endeavor. They will become aggressive if they felt under attack, which moving their nest would be. It is better to wait until cold weather when they die a natural death, then the nest can be removed. A few weeks ago my neighbor’s son ran through the house on our playset and was rewarded with 38 stings. We thought they were wasps, sprayed and removed the nest. It was about the size of a large softball. We were aware that any that weren’t at home may try to relocate nearby, and we kept watch for that. Today, my 4-year-old spotted a nest 20 feet above the same playset (about 30′ in a tree). It is a very large football, and quite active. We want to remove it simply because it’s directly above the play area and I don’t want another child experiencing the agony of dozens of stings. Your site says they are not threatening unless people are close to the nest. We can’t reach this nest with Hot Shot that is 27′ range. Is it worth worrying about? We live in northern VT and we are already dropping into the upper 40s at night. Will the nest fall in a strong wind? It’s so large, and we’ve had a few wind storms come through that I would have thought it wouldn’t be able to stay on the thin branch it’s on. Sorry to hear about the child! Cold weather will slow the wasps activity, but warm days keep them active once they warm up. The paper nest them make are very sturdy, often lasting through the winter snow and winds. However, if a strong hurricane hits, there is always the possibility the nest could be knocked off.